Nestled deep within beautiful woodland, Woburn Forest is Center Parcs 5th and latest UK location. Just one hour north of central London, Woburn boasts up to 200 indoor and outdoor activities, and features their largest Subtropical Swimming Paradise. 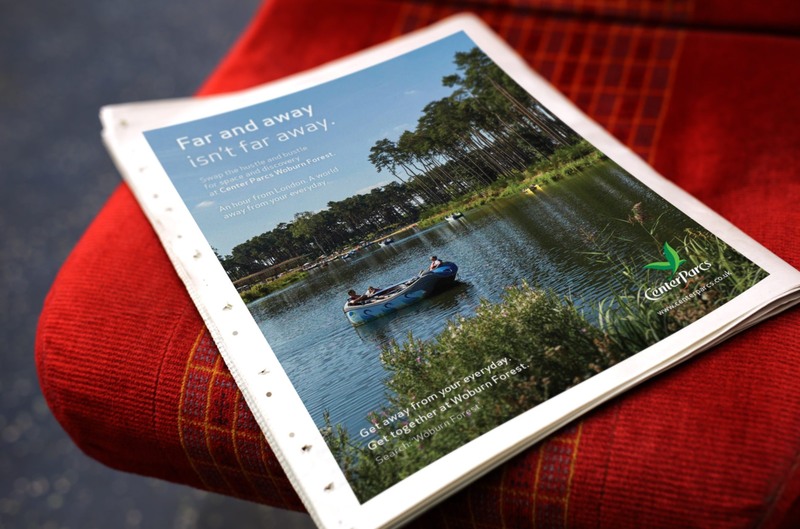 Recent developments had seen Center Parcs build a raft of new accommodation at Woburn Forest, and they now required an above-the-line campaign to help generate awareness of this beautiful haven amongst families within North London and the surrounding commuter belt. Running alongside a cinema ad, the Woburn Campaign was backed with a strong media strategy, capturing some of London’s prime digital out-of-home locations. 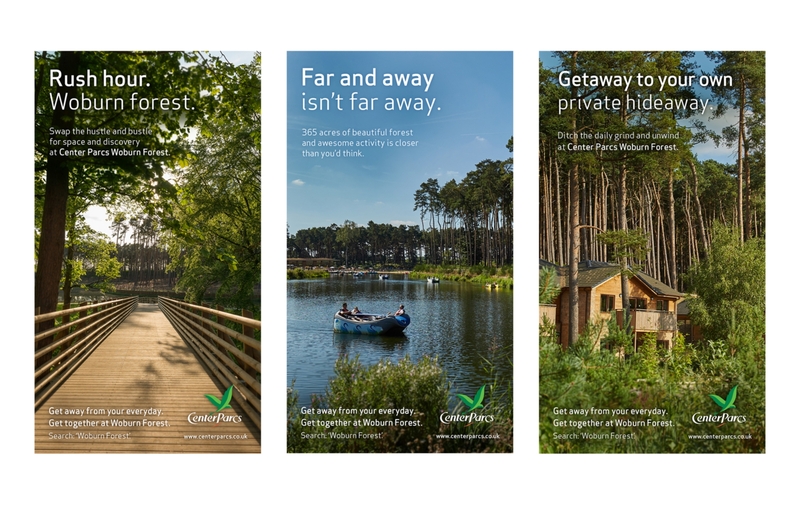 Supported with full page ads in the Evening Standard, and a big geo-targeted social media campaign, our brief would focus on tapping into the busy lives of modern working families, and delivering a compelling reason to consider Center Parcs Woburn Forest as the ideal place for a fuss-free getaway. Leaving behind the daily grind. Our campaign idea was generated around the need to escape the everyday hustle and bustle of modern life – and that finding nature and ‘space to breathe’ is much closer than you’d think. With spring on the horizon, but England still clinging to the coat tails of winter, we developed a number of executions which sat perfectly with their media. In the Evening Standard we found the tired and frustrated commuter with the lines ‘Far and away isn’t far away.’ and ‘Escape the city. Find the Forest.’ as they waited in the cold for another delayed train. The line '‘An hour from london. A world away from your everyday’ highlighting how close they can be to escaping their daily grind. Happiness is nowhere > Happiness is now here. Our lead idea for the digital billboard ads used the ambient scenario that commuters would be sat frustrated in traffic, or stood waiting for trains when they saw the ads. Mirroring a monotonous environment, we presented an alternative view of beauty, peace and optimism – presenting a stunning view, uncluttered by cars and commuters, and delivered with the simple line ‘Rush Hour. Woburn Forest.’, contrasting their ‘everyday’ hustle and bustle with the serenity of the forest. An alternative reality available just up the road. Our integrated campaign ran across poster, press, digital ooh, social media and online banner ads. The underlying message, that you can escape whatever your ‘grind’ is – be it work, chores or boredom, and take the break you deserve was broad in appeal, but also worked in a narrow, more personal way – by talking directly to individuals within their environment, thanks to a smart media strategy providing the springboard to a strong and relatable creative idea.